If you live with arthritis, it might be comforting to know that there is a way to manage the pain. The stiffness, swelling, and more doesn’t have to be as bad as it is. Though commonly treated with painkillers, getting treated drug-free at Grieb Chiropractic Clinic is a viable option to help with aching joints. Multiple types of arthritis exist, some of the most common being rheumatoid arthritis, gout, septic arthritis, and osteoarthritis. Rheumatoid arthritis is one that stems from the body’s immune system. The immune system is meant to kill viruses and disease in the body, but when it mistakenly attacks the joints, this type of arthritis occurs. Gout, another common arthritis, is an inflammation at the joints. It happens when a person has high levels of uric acid in the blood, which is created when the body breaks down substances known as purines. Pain usually begins in the big toe, and is excruciating and sudden. Septic arthritis happens most commonly when germs are directly injected into the joint – this could be from an injury such as a scratch or tear. It severely damages the cartilage and is most common in the knees. Osteoarthritis comes from overused or misused joints. It wears down the cartilage, eventually thinning it altogether and causing the bones to change in shape. A common cause of osteoarthritis – the most common arthritis that exists – is Degenerative disc disease. With Degenerative disc disease, a person will feel a numbness or pain originating from the discs in their back. The word degenerative simply implies that the disc is deteriorating. 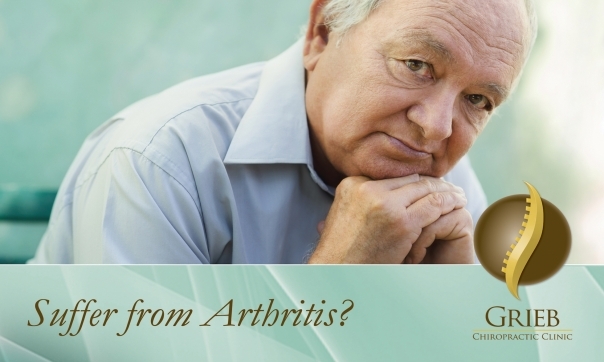 It is something that can result in the arthritis as mentioned before – but the pain from it can be relieved through treatment from Grieb Chiropractic Clinic. There are multiple recommendations for arthritis relief that you can try at home. Nutritional changes in your diet can help the discomfort. Taking Omega-3 fatty acids is beneficial for osteoarthritis because it can help produce anti-inflammatory chemicals in your body. Eating an alkaline diet and keeping active are other ways to relieve your pain. Movement is essential to lubricate and keep your joints healthy. Exercises that won’t stress your joints, such as swimming or yoga, are good options to keep active and keep away pain. By visiting Grieb Chiropractic Clinic, you can discover the best way to help your pain without using drugs. We offer a free spinal analysis so you can discover the cause of your arthritis and learn how to go about treating it. Restoring lost range of motion in the joints and improving flexibility and muscle tone are only some of the ways visiting our office can assist you. Call (724)-935-6050 today to schedule an appointment and start on your journey to pain relief!